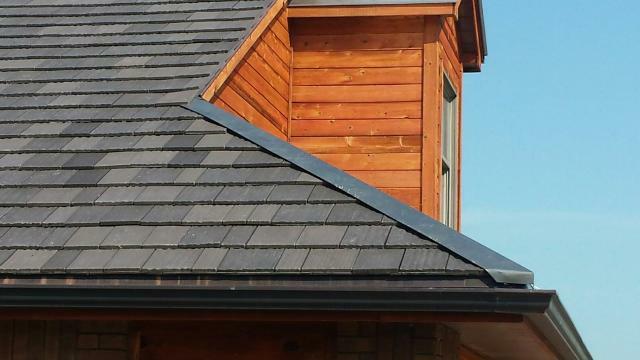 In the open areas of Brock, Nebraska, wind storms and severe rain can have a truly devastating impact on cedar roof shingles. 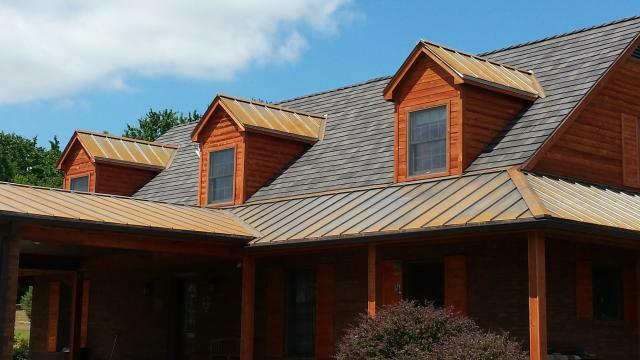 So, when the Butler family decided to replace their cedar shake roof, they searched for a Class A Fire Rated roofing product that was impact-resistant and had a 50 year roof warranty. "We started searching online for long-lasting roofs and discovered the polymer shake tiles from DaVinci Roofscapes," says Kim Butler. "At the same time we remembered the appeal of steel roofs we'd seen in Montana. Somehow we knew we wanted to combine the two products." now features an aging artisan metal roof. Combined with other exterior textures (including brick, cedar and copper), the home has a unique appeal. "We really like how metals patina with age to give a rustic look," says Butler. "With a steel roof and copper gutters, we believe the slow progression of the patinas will bring long-term beauty and durability to our home. Add in the DaVinci composite shakes and we have a winning combination. "It used to be that with each rain and wind storm we were losing pieces of our original wood shingles from the roof. Now we have a composite shake roof overhead that we trust will provide us with decades of service." Jealous of the Butler home? See Roof Envy – A Tale of Two Roofs!